There is a wide variety of excellent dining in the Down City area of Providence that is within easy reach of PPAC. From casual to fine dining, Providence is known as one of the hottest culinary spots in the country! Be sure to make time to experience the finest cuisine before or after your visit to PPAC. Backstage Kitchen + Bar, located at Hotel Providence, is just one block from PPAC. Featuring creative entrees, innovative cocktails, and an inspiring location, Backstage is the perfect spot for your pre-show dinner or post-show cocktail. Our three course theater menu is offered exclusively on PPAC show nights, designed to be sure you don’t miss the opening of the curtain. Running late? Come back after the show to enjoy dessert! Experience what happens when you step behind the curtain. The first Yoleni's physical store in the US was launched in May 2018 in Providence, Rhode Island, in a 1895 landmark building, following Yoleni's Flagship store model, in downtown Athens, Greece! The store offers visitors a complete experience of the authentic Greek gastronomy. Enjoy a handmade pita, authentic Greek yogurt, mouthwatering sandwiches, hearty salads, fresh juice, selected Greek wines and more than 20 traditional Greek recipes in Yoleni's "Topos" restaurant! Before you go, don't forget to explore more than 800 artisanal Greek products in the deli shop. There’s always something happening in Downcity Providence! Whether it’s a show at PPAC, a game at the Dunk, or a convention at the, well, the Convention Center, there’s entertainment to fit any taste. And what’s smack dab in the middle of all of these venues? Yup, Blake’s, the most convenient place to grab a bite or a drink before or after your event. Bravo Brasserie is an elegant eatery located in the heart of downtown Providence. It is two blocks from Kennedy Plaza and is adjacent to the Providence theatre district. Bravo is a full service restaurant complete with excellent menus and a large selection of wines from regions around the world. Bravo Brasserie has a stylish atmosphere that is great for a nice sit-down lunch or dinner. In the evenings it has a cozy lounge that is perfect for a few drinks with friends. The atmosphere also calls for couples with intimate indoor and outdoor seating great for specialty drinks and audible conversations. Located on the second floor is an outstanding banquet facility for private functions. It has large picture windows overlooking the city in the downtown theatre district. It’s a must see!!! From dry-aging steaks on premises to helping select the perfect wine complements from a list of over 350, we’ll surround you with the very best. That includes the surroundings themselves. We realize the first things you’ll notice at The Capital Grille may not be hand-crafted mahogany, plush leather or distinctive art. The aroma of sizzling steaks guarantees that. Davenport’s Bar & Grill in East Providence has been a favorite of locals for nearly 10 years. Known for it’s great food and service, it was recently voted Best Neighborhood Restaurant in the Blackstone Valley by the readers of RI monthly. Since opening their first restaurant in Cumberland in 1990 and their second in 2000 the Davenport family has never lost their focus of providing the highest quality food and service at a family affordable price. Our mission is simple – enhance and educate the palate with the freshest ingredients and flavors. Our guests take center stage with a philosophy focused on surprising and exciting each guest with personal care and service. Our team is motivated by a central goal – making sure each dining experience is memorable. It’s like bringing our Oyster Bar to your place. Not just your lunch, dinner, or on-site party destination, Hemenway’s also offers large specialty platters for your function. The perfect solution for any off-site gathering; you can expect your usual favorites, just as fresh and delectable as if you were dining with us. Mix and match from our most popular appetizer selections below to create your own customized seafood experience. All you need to do is make one simple phone call at 401-351-8570 to make the arrangements. We’ll take care of the rest and have it waiting for you when you are ready. Clams Casino, smoked Salmon, Bruschettas, and much more – all at your convenience! The Parkside Rotisserie and Bar is a Manhattan-style bistro centrally located in the heart of Rhode Island’s capital city, Providence. Serving lunch and dinner daily, the Parkside is surely a fantastic choice anytime. The Parkside offers a wide array of upbeat foods ranging from spicy crab cakes to grilled tenderloin and portobello salad. There are also several innovative pasta dishes as well as the Parkside’s signature rotisserie meat items and daily specials.The Parkside’s unique atmosphere is accented by an open kitchen where guests can enjoy watching our talented culinary staff prepare all of the enticing entrees found on the menu. Rhode Island’s only Coal Fired Pizza Restaurant using Authentic Pennsylvania coal. Custom Coal oven from Seattle Washington will be firing up, crisp tasting Artisan Pizza Recipes to perfection, along with other Coal-Inspired Traditional Menu items such as Wings, Chicken and Ribs. Great atmosphere in lively downtown setting. Plenty of T.V.’s to either watch a game or eat before attending local downtown entertainment. Restaurant will have combination of sit down area, private dining, community tables, bar menu and even take out and local delivery. Interior Design by Libby Slader Designs. Located in the heart of Providence’s historic Federal Hill, Siena offers authentic Tuscan cuisine in a warm, inviting and lively atmosphere. Evolved out of Chef/Owner Anthony Tarro’s ardor for Tuscan cuisine, the menu features fresh, simple, unfettered food that you could find at dinner tables throughout Tuscany served in a warm inviting casual fine dining atmosphere. 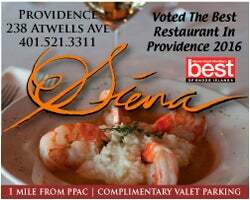 Voted Best Italian Restaurant Providence in 2016 and Best Restaurant in Rhode Island ~ 2015 (Rhode Island Monthly) We invite you to visit our other locations in East Greenwich and Smithfield. Sakis Pizzeria was established on August 5, 1982 and was founded by owner Dionisios (Dennis) Sampalis. The goal was to create a pizzeria serving delicious, affordable food with a Greek twist to the downtown Providence public. The small family business was opened in one of Providence’s oldest historic buildings, across the street from the Providence Preforming Arts Center and Johnson & Wales University. In 2010, after years of planning, the Sampalis family undertook the renovations of the historic building and the restaurant, transforming Sakis Pizzeria to include a full service pizzeria, bar and grille. Today, as you enter the pizzeria, a winding staircase leads you to the new mezzanine overlooking Weybosset Street, where our clientele can enjoy a few drinks while sampling our new menu and watching a sports game. Our redesigned menu features new items and old favorites including specialty pizzas, salads, wraps, paninis, grinders, pasta dishes, club sandwiches, various seafood platters, Greek sandwiches and Greek pastries. We take pride in every dish that leaves our kitchen and hope that Sakis Pizzeria is and will continue to be your neighborhood choice for dining in or taking out. We greatly appreciate our loyal customers that we have been serving since 1982 and look forward to impressing our new customers! We thank you for your business and continued support! !